1. Variant CJD is also sometimes known as 'Human Bovine Spongiform Encephalopathy, BSE', 'New Variant CJD' or 'Mad Cow Disease'. This was first identified in 1996 and is the type most likely to make the headlines in the popular press. 2. Sporadic CJD. This was first described in the 1920s and remains the most common form of the disease. It affects approximately one person in a million per year and there are around 50 cases annually in the UK. Its cause remains unclear but it does not seem to be linked to cattle BSE or so-called 'mad cow disease'. 3. Genetic (Familial or Inherited) CJD. This form is rare, and there is a family history of the problem in these cases so it appears to be an exclusively inherited condition. It kills less than 5 people each year in the UK. 4. Iatrogenic CJD. This form is caused essentially through medical accident or contamination such as through infected surgical instruments. Exact numbers as to how common this form is remain frustratingly unclear. 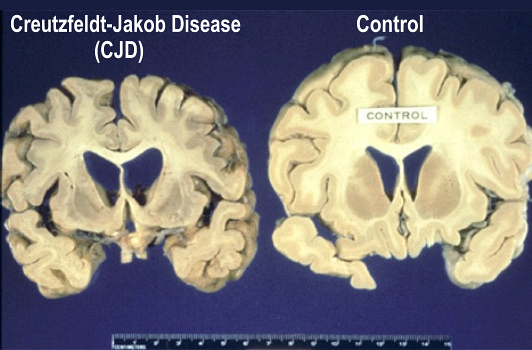 Creutzfeldt-Jakob Disease is caused by an infectious abnormal form of the protein called a prion. These abnormal prions accumulate at high levels in the brain and cause irreversible damage to nerve cells, causing the symptoms of the disease. Prion protein PrPC is a naturally occuring protein in the brain that is produced by a gene on chromosome 20 (called the PRNP gene). In CJD, the prion protein, PrPC mutates into an abnormal form known as PrPSc. Due to a mechanism that remains unclear this change causes steady and irreversible neurological destruction in the brain that is ultimately fatal. • Variant CJD is related to BSE in cattle. Virtually all authorities are in agreement on this point. There is increasing evidence that the infective agent is able to be passed on from cattle to man through the food chain, especially in cheap meats that may have contained contaminated brain or spinal tissue. 'Normal' meat - that is pure muscle and that has no contact with brain or spinal tissue - does not seem to present a risk in all the studies to date. Since the link between variant CJD and BSE was discovered in 1996, strict controls have proved extremely effective in preventing meat from infected cattle from entering the food chain. The prion that causes variant CJD can also be transmitted by blood transfusion. • Sporadic CJD is the most common type of CJD. The precise cause of spradic CJD is unclear, but it has been suggested that in some people a normal brain prion protein undergoes an abnormal change (misfolding) and turns into an abnormal prion protein. Most cases of sporadic CJD occur in older adults aged between 45 and 75 years, with the average age of symptoms developing being around 60-65 years. Despite being the most common type of CJD, sporadic CJD is still very rare, affecting only 1-2 in every million people each year in the UK. There were 83 recorded deaths from sporadic CJD in the UK during 2012. • In the genetic (familial or inherited) form of CJD the PRNP gene is mutated and inherited from one parent, giving a 50% risk of developing CJD. If both parents have the mutated gene, CJD is almost inevitable. It affects about 1 in every 9 million people in the UK. The symptoms of familial CJD usually first develop in people aged in their early 50s. • There are a number of theories as to how Iatrogenic CJD is caused, including previous treatment with natural (not synthetic) human growth hormone, corneal transplants and human gonadotrophin injections such as those used in fertility treatment. With increased awareness of these risks, iatrogenic CJD is now very rare. What Are The Signs And Symptoms Of Creutzfeldt-Jakob Disease? All types of CJD have variations on the same theme here, all relating to a progressive dementia-type picture. The speed of deterioration may vary between individuals but the progress is inexorable. There is memory loss and lack of co-ordination and deterioration of mental abilities. Balance problems are common and often occur early on. There may be progressive blindness, psychiatric symptoms and problems with speech. Many patients become immobile and unable to look after themselves at all in the later stages of the disease. Because of the nature of CJD, virtually any symptom is possible. It depends on the area of the brain that is being affected by the disease. Most people will have had a whole battery of tests performed, often as a hospital in-patient, before a specialist makes the diagnosis. These will include brain scans, electrical recordings of the brain (an EEG), lumbar punctures to examine the spinal fluid and generalised blood tests to rule out any other possible cause for the symptoms. These include other causes of dementia such as Alzheimer's disease or motor neurone disease, psychiatric problems such as schizophrenia or major depression or major abnormalities in the body's hormonal balance. What is certain is that all other avenues will be exhausted before a definitive diagnosis of CJD is made. 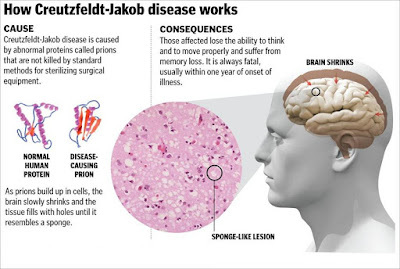 There is no cure currently known to man for Creutzfeldt-Jakob Disease in any form. The length of illness depends to some extent on its type: some people live for several years before death, while some people with sporadic CJD die within weeks. There are common complications as the clinical picture worsens over time, including pneumonia, incontinence, bedsores, and recurring infections - increasing levels of support from hospitals, hospices and care workers are needed during the illness - and each case has to be treated strictly according to its own particular problems. 3. Is there any family history of dementia? 4. Do you have a diet high in junk food? 5. Is your general physical health good? 1. What tests might I need now? 2. How likely is it I may have CJD? 3. What other possible causes are there for my symptoms? 4. Do any family members need tests? 5. Do I need any genetic tests?